The worm gear hand winch is known for it’s robust construction. The winch can be used as lifting winch and pulling winch. The hand winches are equipped with a load pressure brake. This brake holds the load at any required height during hoisting and lowering of the worm gear hand winch. 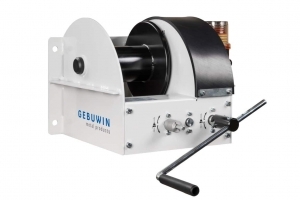 These manual winches have the best braking system, due to the fact that 50% of the braking is done by the friction in the worm gear transmission. Subsequently, the load on the pressure brake is greatly reduced. The lifting capacities are calculated according to the first cable layer on the cable drum. You can operate the winches manually and use them in all kinds of environments like the offshore and marine industry and use them for lifting or pulling applications.